Kindergartener Mya Townsend crunched into a chicken nugget while wedged between chattery friends on a bench in the sun-filled cafeteria at Burke Elementary School on Monday evening, March 29. The kids were munching away on dinners of chicken, corn, sliced kiwi, bread and milk. Mya is one of nearly 700 Hickman Mills C-1 elementary kids now eating dinner at school before heading home. For Mya’s mom, Angela Hunter, the district’s new dinner program is a time-saver. A Security Guard at Ward Parkway Shopping Center, Hunter said her daughter used to be hungry right away when they got home in the evening. Since January of this year, thousands of dinners have been served to Hickman Mills’ kids. That means the school district is now feeding many of its students three square meals every school day – breakfast, lunch and dinner – as well as partnering with the community to send healthy snacks home on Fridays to help kids throughout the weekend. 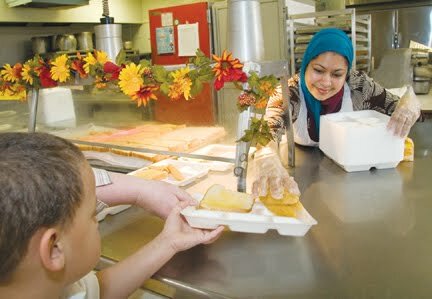 Dinner was first served at school in January to approximately 700 of the 3,200 students in Hickman Mills’ eight elementary schools. Students in the Local Investment Commission (LINC) after school program are eligible to eat the free, healthy dinners every school day. Schmidt sees the need first hand. “There may be a child who may not have a meal at all until the next morning unless we provide it,” she said. or more of the children are eligible for free- or reduced-price meals. Jim Morris, with the Missouri Department of Elementary & Secondary Education (DESE), explained that the Supper Program reimburses the school district a total of $2.875 per meal served. For the 10,000 dinners served in January, Hickman was reimbursed $26,000. The dinners are a blessing for many families in the Hickman Mills School District, where 78% qualify for free- or reduced-price lunches, a program which began in the 1960s through the federal government. Most feedback from families is positive. For single mother-of-three Keona Williams, the school-provided dinners allow her time to give her children—fourth-grader Javontae Brock and second-grader Kiance Brock—her full attention with their homework. “Before I had to cook at the same time as trying to help them,” Williams said. “Now, mom can take time off from cooking and help me with my homework, especially math,” Javonte said. A Certified Nurses Assistant at Jefferson Health Care, Williams usually gets off work about 5pm and is relieved that she no longer has to stop at the store and do dishes on school nights along with homework, baths, ironing, combing her daughter’s hair, and reading with the kids—all before 9pm. “The best thing is not having to cram everything into four hours,” said Williams, who usually just grabs cereal or a sandwich for herself after the kids are in bed. Last year, Missouri schools served an average of 606,476 lunches and 223,071 breakfasts each school day as part of the National School Lunch and Breakfast Program administered in Missouri by the Department of Education. Some 44% were served free, and about 10% were served at reduced price. Those numbers are projected to increase over the next three years – primarily because of the nation’s economic slump. DESE’s Jim Morris explained that because of the slump, the federal government is boosting funding for some programs due to increased needs among children and families. Morris doesn’t see this as a shift in the school districts’ role, beyond reading and writing. Morris said schools are trying to do what they can to assist struggling families and to meet the nutritional needs of children. Last month in Hickman Mills, the district budget was amended to include cuts to various programs and funds. The only program to receive increased funding was the Food Supper Program through the Department of Health and Senior Services. The Supper Program increased by $175,000. “Many of our families are struggling financially and providing a nutritious meal after school helps them stretch limited funds,” said Gayle Wood, the district’s LINC liaison. Burke Elementary Principal Casey D. Klapmeyer agrees. Klapmeyer thinks families without students in the district don’t always understand the support, besides teaching, schools try to offer families. Now in its second year, Hickman’s “Back Snack Club” is one more way district personnel, with help from the community, are doing what they can for kids. “When we started back snacks, we found out a lot of kids were going home to nothing,” said Mims. With support from local churches and food pantries, the district fills back packs (provided by Harvesters Community Food Network) with nutritious snacks. The packs are sent home with children after school on Friday so that they have food to eat over the weekend. Hickman Mills Community Christian Church Volunteer JoAnne Karaff explained that people bring in donations throughout the year for the program. The money is not only used for food but for other things such as uniforms and school supplies as well. “Our church has pretty much gone through the money we have,” Karaff said, indicating the need for donations. Karaff explained that kids qualify for the program on a need basis based on income, as well as through teacher and counselor recommendations. HM Director of Nutrition Services Leah Schmidt explained the process. Schmidt said the Community Assistance Council (CAC) is a key player in making the Back Snack Club happen. Every Wednesday afternoon at 1:30 pm, volunteers from Hickman Mills Community Christian Church pack food bundles donated by Harvesters at CAC, located at 10901 Blue Ridge Boulevard. Specific snacks are selected in order to be easy for kids to prepare themselves, such as microwavable meals, pudding cups and juice boxes. “The snacks are different each week,” Schmidt said. Last week’s pack included Vegetable Soup, Saltines, Granola Bars, Bean & Franks, Milk, Juice Boxes, Cereal, Pudding, and Canned Peaches. Schmidt said she feels good seeing kids get healthy snacks. She’s seen kids come to school hungry.